All those analysts predicting Windows Phone as No. 2 smartphone OS in 2015, lifted by Nokia magic, need a reality check. Put away the crystal balls and peer into the present. Today, IDC released fourth-quarter smartphone shipment data, whoa, is the data chart scary. Shocker is Nokia's smartphone death spiral, which no Windows Phone has yet lifted. The once mighty Finnish handset maker ended the quarter with 12.4 percent market share, down from 27.6 percent, and plunging from first place a year earlier to fourth at end of 2011. This is the same quarter Nokia launched its first Windows Phones, the Lumia 710 and 800. Right now, looks like Windows Phone can't save Nokia, which cuts the other way, too: Nokia can't save Windows Phone. Apple and Samsung were the big beneficiaries of Nokia's nose dive. IDC's data affirms Strategy Analytics findings from late last month: Apple and Samsung ended fourth quarter in near smartphone shipments photo finish. iPhone did better -- 37 million units to Samsung's 36 million. Both vendors saw huge year-over-year gains. Samsung's shipments rose 275 percent year over year, going from fourth to second ranking -- market share rise from 9.4 percent to 22.8 percent. That's better than Apple, which was no slouch. Shipments grew 128.4 percent, with share rising to 23.5 percent from 15.9 percent. By comparison, Nokia's share fell 30.6 percent -- or nearly three times the other laggard. Research in Motion share fell 11 percent to 8.2 percent from 14.3 percent. Apple and Samsung largely split the smartphone market's largest portion, shipping 73 million of the quarter's 157.8 million units. "The launch of Apple's iPhone 4S played a key role in smartphone growth to capture pent-up demand, and smartphone launches from other vendors also provided a broad selection to meet varying preferences and budgets", Ramon Llamas, IDC senior research analyst, says. The majority of "launches from other vendors" were Androids. "So-called 'hero' devices, such as Samsung's Galaxy Nexus and Apple's iPhone 4S, garner the bulk of the attention heaped on the device type", Kevin Restivo, IDC senior research analyst, says. "But a growing number of sub-$250 device offerings, based on the Android operating system, have allowed Google's hardware partners to grow smartphone volumes and expand the market concurrently". No Android partner benefitted more than the aforementioned Samsung. Fourth-quarter smartphone shipments exceeded IDC's growth forecast of 40 percent, rising 54.7 percent year over year. "By the end of the quarter, one out of every three mobiles phones shipped worldwide was a smartphone", Llamas says. For all 2011, smartphone shipments rose 61.3 percent to 491.4 million units from 304.7 million than a year earlier. While growth exceeded IDC's forecast (54.7 percent), it fell below 2010's year-over-year growth (75.7 percent). 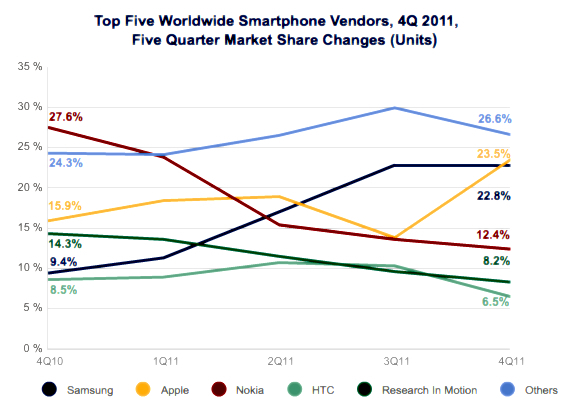 While the smartphone market grows gangbusters, Nokia is the biggest loser -- and Windows Phone along with it. If Lumia's launch quarter is any indication, the road back, if there is one for manufacturer or operating system, will be long and arduous. One year ago this week, Microsoft and Nokia announced a sweeping distribution deal where Windows Phone replaces Symbian as primary operating system. So far, the Windows Phone transition is killing Nokia, not that it had a workable smartphone strategy before. Microsoft has committed $1 billion annually in payments to Nokia, as part of the agreement. The return on that investment is what? Coincidentally, today, Microsoft Store started taking pre-orders for the Nokia Lumia 900; there's a $25 reserve. That handset's success or failure may answer the question, or at least foreshadow it.